A few years back had the daughter and I living together, in a one bedroom apartment trying to get back on our feet as a family unit. It was a spacious one bedroom but we had­­­ furniture for a two bedroom apartment. We live in a two bedroom condo now. So why do I feel that strange, over run by animals feeling, creeping up on me again? Maybe it is because my daughter brought home a feeder mouse as a pet. Did anyone forget we have two cats? 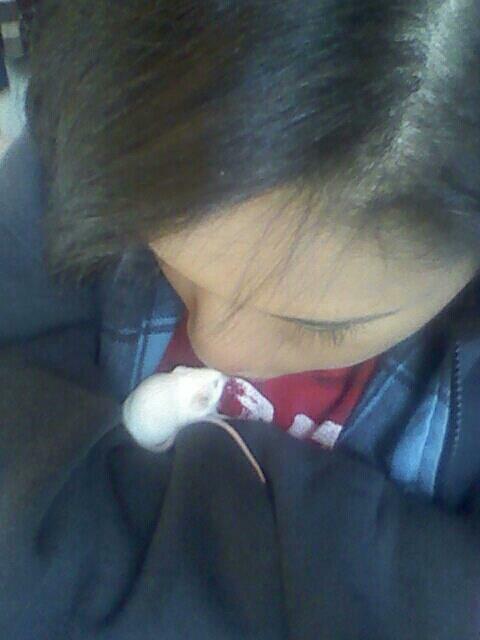 Does anyone have any idea how to feed and care for a pet mouse? What the heck is going on here? Oh well Melody the mouse is cute enough in a rodent sort of way. Back to the one bedroom. Maybe it was not the size but my daughters perspective on it all, life and pet ownership. So we took in two kittens from a litter a few doors down from us. Their mother had not litter box trained them. That was an adventure. A cute little adventure that had me digging a kitten out from behind wall furniture but we made it past that hurdle. Then a mom I knew through social media sent out an SOS about a friends' cat they were trying to adopt into their household. The friend was out of town or out of state for good and had left two cats. One was fine and one was not doing so well. Her house, with two little kids under 7 was too much for this older kitty. Would anyone take her. We said yes. The family even delivered her to us in a cardboard pet carrier. I set the carrier inside the apartment and went back out to say goodbye to the family. What was inside the carrier was a grumpy, SMELLY, anti social, fully grown, black, female cat with talons not claws. She hissed at the kitten who for the first time in it’s life arched it’s back and puffed out in defense mode scared to death! To all of this, weeks later, my daughter wanted to add yet another kitten from the litter. I said "No". She kept asking. I held firm. So did she. One afternoon she was on the patio with the third kitten. Through the screen she tried to tempt me to agree to adding it to our household. I really thought she was nuts. She got mad at me for not budging. "Listen here is the deal, no other living creature can live in our home. Five is enough. So you can add the cat if you want to sleep outside. Otherwise the answer will remain no." She gave me a mean look and stopped talking to me but eventually she came inside, without the kitten.